Arguably, the biggest surprise of the TG-850 is how good the image quality is. That's by no means a derisory comment towards Olympus, but more towards Tough style cameras as a concept. Typically – and based on other reviews of similar style cameras from all manufacturers – image quality is low down on the list of priorities, but here Olympus seem to be getting it right in most places. Sure, the tough capabilities aren't the best, but the other features are better than what we've seen on similar models. Using the camera is very easy. Olympus have kept the menu system plain and simple to use. The black background and yellow highlight is extremely clear. Using the flip up screen certainly helps with getting low down and if you're not in the water as well, you'll find it will be easier to see the image you're shooting. However, it would be a lot easier if the screen rotated as well, although we understand the difficulties with this. Shock and waterproof technology has improved over the years. A 10m depth is enough for light scuba and snorkelling but the improvement on the TG-850 is with the drop height. 2.1m drop height is ample for most people, so we weren't concerned when a clumsy four year old grabbed it and started taking pictures. Picture quality is lovely from the TG-850. However, we did find that the pictures seen on the review screen of the camera look a little paler than what is actually seen at home on a computer monitor. So don't worry too much about a pale image. With the rise on popularity of smart phones with built in cameras, it can be tricky pricing a camera to be competitive. Even waterproof cameras can't escape with certain Sony phones being waterproof. What the Olympus offers is a far superior proofing capability and image quality to ensure you have a much better photographic experience than you'd get just with a mobile. If you're going on holiday and have kids, then a camera like this is something you need to consider. It looks like a normal camera and has the added benefit of helping with self portraits. Travellers may look at a camera like this to cope with all areas of the world they may want to visit, but the downside is that the TG-850 has a separate charger. It may not sound much, but it takes up extra precious space that could be used for something else. 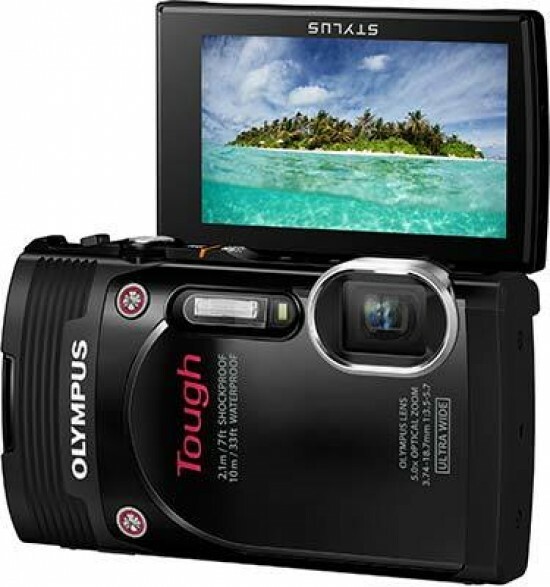 If you're in the market for a waterproof camera that looks good and provides very good image quality, then the Olympus TG-850 is a worthy model to consider.